In the original version of this report, all the data in Tables 46 and 47 were incorrect. The correct numbers now appear in the report. The original version of this report contained an error in the Notes to the section on Beneficiaries Who Have Filed for Workers' Compensation or Public Disability Benefits. The number of disabled workers on the Social Security Disability Insurance program that had filed for workers' compensation or public disability benefits in December 2013 was incorrect. The correct number now appears in this report. Disability benefits were paid to just over 10.2 million people. Awards to disabled workers (868,965) accounted for over 90 percent of awards to all disabled beneficiaries (965,190). In December, payments to disabled beneficiaries totaled about $11.2 billion. Benefits were terminated for 769,171 disabled workers. 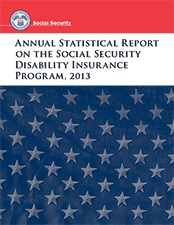 Workers accounted for the largest share of disabled beneficiaries (87.4 percent). Men represented under 52 percent. Average monthly benefit received was $1,146.42.